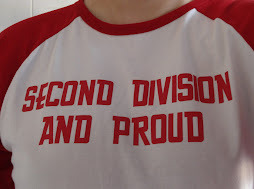 Second Division And Proud: Ginge! So, on the day that all four second division teams progressed as (unexclusively) predicted here at 2DAP to the second round of the League Cup, Charlton were signing a ginge! Oh woe is me, the shame of it – no seriously one of my best friends is a ginger, I also know people of ethnic minorities and gays – I don’t mind any of them, just not the taffs in our league ;-) In terms of gingers I’ve a bit of a soft spot really and Gillian Anderson, Patsy Palmer, Lindsey Lohan, Gillian Anderson, Nicole Kidman, Fergie (not that one! ), Shirley Manson, Gillian Anderson, Louis Griffin and even Catherine Tate are welcome at the Valley (or round mine) anytime as far as I’m concerned ... did I mention Gillian Anderson? No Halliwell though – she’s a head the ball!!! So with 14 second division teams progressing to round two, most have avoided each other with only Southampton v Birmingham and Preston v Derby creating two all round two, division two ties. Elsewhere Coventry and Forest, as well as the Valley victors of Tuesday Yeovil, get money spinning ties against first division opponents. Good luck to them, they'll bloody need it. so what's your problem fella - what's wrong with redheads? the welsh? palace? cymrophobia? It was the wise sage Jeremy Clarkson who once said 'It’s entirely unfair that some people are born fat or ugly or dyslexic or disabled or ginger or small or Welsh. Life, I’m afraid, is tragic' not me ... lay off the gingas Jez!! !